The essays in this collection give voice to the plurality of approaches that scholars in the field of rhetoric and composition have when they set forth to assimilate Bakhtin for their varied purposes. The collection is arranged in three major sections. The first attempts to capture the most important theoretical extensions of Bakhtin's ideas, and does so with an emphasis on what Bakhtin might contribute to the present understanding of language and rhetoric. The next section explores the implications of Bakhtin's work for both disciplinary identity and writing pedagogy. 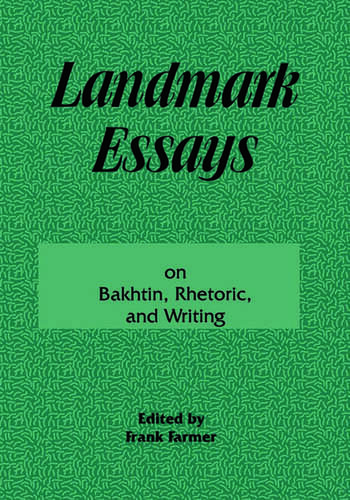 The final section looks at how Bakhtinian thought can be used to bring new light to concerns that his work either does not address or could not have imagined addressing concerns ranging from writing across the curriculum to feminism, and from computer discourse to the writing of a corporation annual report. Together, these essays demonstrate how fruitfully and imaginatively Bakhtin's ideas can be appropriated for a context that he could not have anticipated. They also serve as an invitation to sustain the dialogue with Bakhtin in the future, so that researchers may yet come to realize the fortuitous ways that Bakhtin will continue to mean more than he said. Contents: Part I:Theory, Language, Rhetoric. C. Schuster, Mikhail Bakhtin as Rhetorical Theorist (1985). R.A. Harris, Bakhtin, Phaedrus, and the Geometry of Rhetoric (1988). J. Klancher, Bakhtin's Rhetoric (1989). T. Kent, Hermeneutics and Genre: Bakhtin and the Problem of Communicative Interaction (1991). K. Halasek, Feminism and Bakhtin: Dialogic Reading in the Academy (1992). M. Bernard-Donals, Mikhail Bakhtin: Between Phenomenology and Marxism (1994). M. Cooper, Dialogic Learning Across Disciplines (1994). K. Halasek, M. Bernard-Donals, D. Bialostosky, J.T. Zebroski, Bakhtin and Rhetorical Criticism: A Symposium (1992). Part II:Composition Studies, Pedagogy, Research. J.S. Ritchie, Beginning Writers: Diverse Voices and Individual Identity (1989). J.J. Comprone, Textual Perspectives on Collaborative Learning: Dialogic Literacy and Written Texts in Composition Classrooms (1989). G.A. Cross, A Bakhtinian Exploration of Factors Affecting the Collaborative Writing of an Executive Letter of an Annual Report (1990). D.H. Bialostosky, Liberal Education, Writing, and the Dialogic Self (1991). T. Recchio, A Bakhtinian Reading of Student Writing (1991). M. Middendorf, Bakhtin and the Dialogic Writing Class (1992). N. Welch, One Student's Many Voices: Reading, Writing, and Responding With Bakhtin (1993). H.R. Ewald, Waiting for Answerability: Bakhtin and Composition Studies (1993). "This particular collection is especially rich and useful, in part because its material--and its editorial method--lends itself to the strengths of the series: It has both a sharp focus (Bakhtin) and a wide scope (rhetorical theory and writing pedagogy)....It would be an especially good test to teach from....There is something of consequence and value in this series for almost anyone interested in research and teaching in composition, and the Hermagoras catalogue is worth consulting periodically to keep up with its new entries."